Fall is here and that means it’s time to break out our favorite fall color – ORANGE! With the largest selection of real German glass glitters, mica flitter flakes, and miniatures we have so many ways to incorporate orange into your seasonal projects. Glitter, Mica Flakes, Iridescent Ice, and More! Need to add some orange pizzazz, sparkle, or pop to your project? Check out all our shades and grits of orange real German glass glitter and crystals. 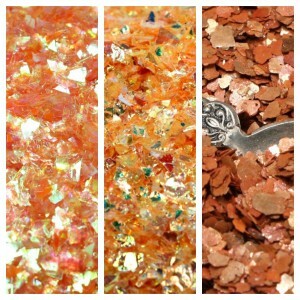 From chunky super shards to powdery fine glitter, we carry a wide variety of glitters and crystals in orange, dark orange, autumn, pumpkin spice and fire orange colors. 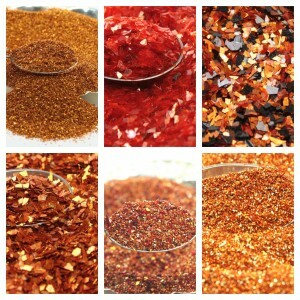 For something a little different, try our orange dark fusion or orange multigrain glitters. So sparkly! To add texture and shine, give iridescent ice flakes in golden orange or orange, or mica flitter flakes in rusty orange a try. Can’t decide? Our orange glitter and beads sampler set gives you a selection of 6 brilliant orange hues to experiment with. Freshly picked from our miniature garden, we offer no fewer than 6 varieties of miniature orange pumpkins for all your autumn needs. Some of our best sellers are pumpkins in vintage fruit crates, realistic pumpkins in a set of 4 various sizes, and of course, jack-o-lantern pumpkins featuring both scary and funny faces. 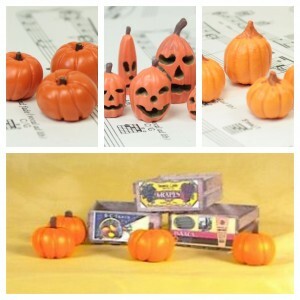 Put them in a diorama, fairy garden, or as the center of your fall holiday table for an extra burst of orange! Sometimes you need a little extra something to bump up your orange quota. For this exact need, head to our miniatures section for doll-house sized orange fruits, traffic cones, or even ceramic mushrooms. To fill out the edges of your orange inspired craft project, how about a little curly German orange lametta, because you can never have too much orange. To see our full line up different products, textures, and materials in orange, or any specific color, try using our shop by color tool to find the perfect hue for your project.